Hello everyone! It’s been a bit since I was around with some writing outside of the Underground schedule, but I’m back today with some hopefully interesting stats on the season so far. In the season-roulette game Michigan is currently playing, today landed on “Have an ice storm!”, so I figured I’d get a start on my planned end-of-season analysis and share some thoughts as they come up. By now, I’ve earned something of a reputation for this sort of Excel use and data analysis… and will probably only embolden that today. We’re in the 4th year of the 2 Day Worlds invite system, but only the 2nd of the year-round grind, and some interesting trends have started to emerge. There’s going to be a lot to look at when this season is all said-and-done. Unfortunately, most of my analysis is limited to TCG Masters in North America because that’s where I have the bulk of data. For the end of year, I’ll make an effort to attain European and other data to draw some similar conclusions, but given nobody can even be sure what Special Events are happening anywhere in the World for the remainder of the season, it’s going to be a tall task. Today, I started my spreadsheet record of the season’s Regional/International Championships. This is a list of the final standings of every such event and a method to convert the final standings to appropriate Championship Points. Last year, this was very useful both for analyzing the composition of the Worlds delegation from US/CA and determining the ramifications of TPCi’s decision to change the CP structure midyear last season. It’ll be good for the former again this season, when all is over, but hopefully the latter won’t be necessary. The number of players involved, in total, with the circuit—especially compared to the total that are frequently involved. 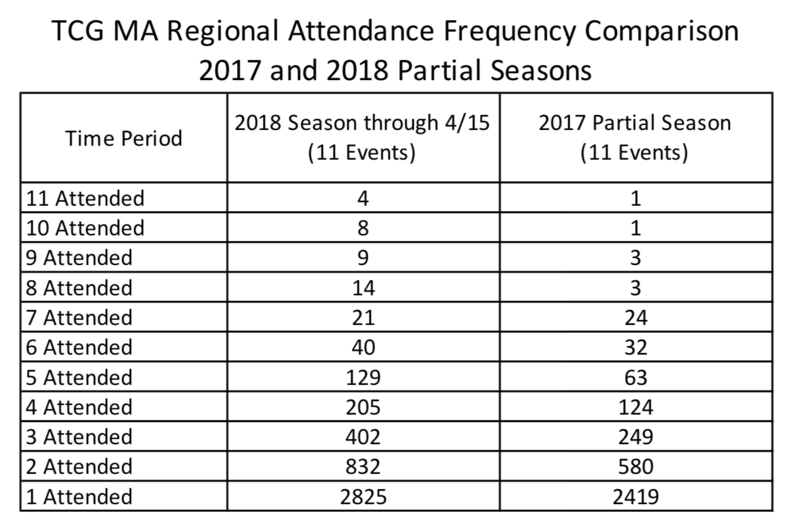 This is looking at the frequency of Regional attendances and such. Going off of that, we’ll explore the Regionals that have the most and least “experienced” playerbases, based on Regional attendances. We’re not enough years in for this to mean much, but it’ll be interesting to examine. The state of the NA Top 16 race, and, specifically, how the current crop’s level of involvement with the circuit compares to last year’s at this stage. For all analysis where it needs to be specified, for “to this point,” I’m going to use a raw event count. For Internationals, that means a one-to-one comparison, as Europe and Oceania were both in the books last year. 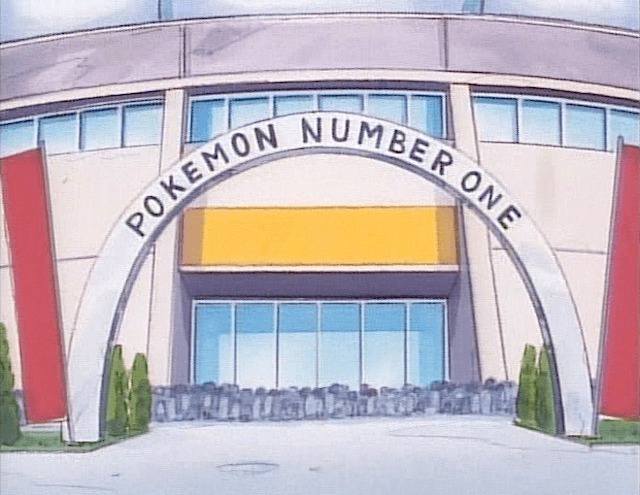 We’ve had 11 regularly scheduled North American TCG Regionals and 1 Anaheim Open to date. There was no Open accompanying the World Championships in 2016, which makes comparisons a little difficult, but I’ll address how it works on a case-by-case basis. 11 Regionals in, though, corresponds to going through Salt Lake City for the 2016/17 season—conveniently enough, this is a fairly accurate analog time-wise, as Salt Lake City was the first weekend in April last season. Personally, a big mystery in the recent growth of the game has been trying to analyze whether there are materially more players involved in the game or whether we’re simply seeing the same players attend more tournaments. This section will try to deal with that question, among other things. The following two paragraphs, and table following, summarize all of the findings I made in this respect. Afterwards, there’s further analysis and a bit more breakdown by Regional. 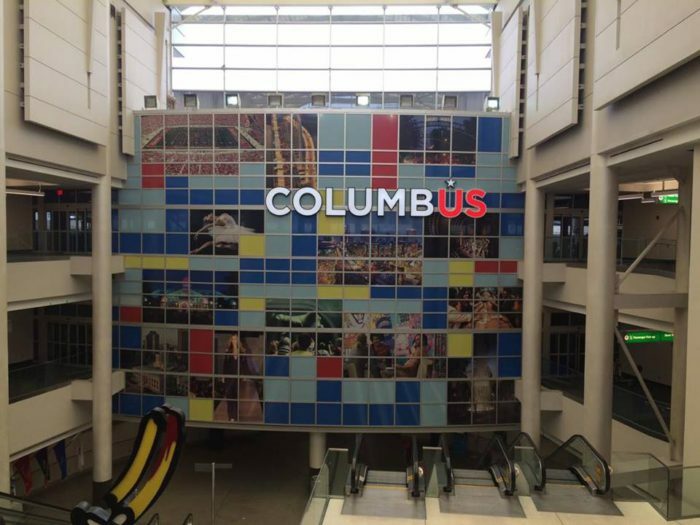 At least 4990 unique Masters Division players have entered 11 TCG Regionals in North America this year—a total of 8125 event entries, for an average attendance of 738. 2720 have only attended a single Regional—55% of the total player pool. Of the 4990, 1144 have earned Championship Points at one or more Regionals this season. 4 players—Caleb Gedemer, Jimmy Pendarvis, Ryan Allred, and Azul Garcia Griego have attended every Regional of the season. 8 have attended all but one, and an additional 9 have attended all but two NA Regionals this season. 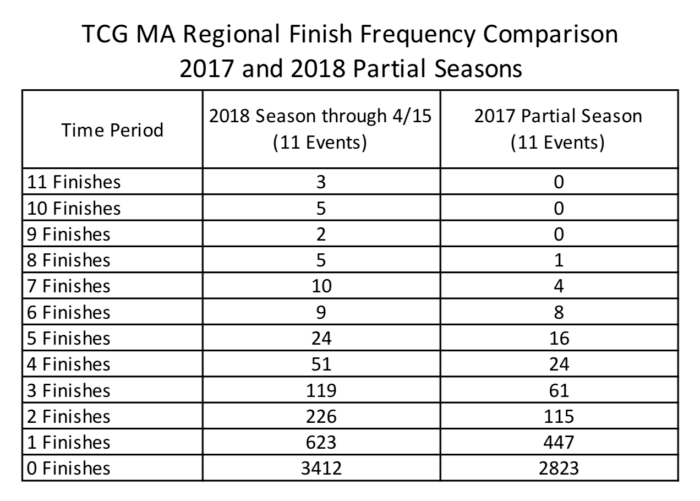 Compared to this point in last year’s season: 3500 unique Masters had entered 11 Regionals a total of 5698 times—for an average of 518 Masters per event. 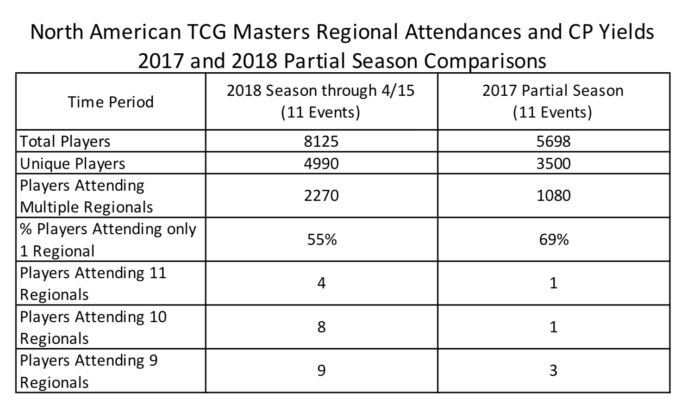 1080 Masters had attended more than 1 Regional, meaning 69% of active players had attended only one. 676 total Masters had earned Championship Points at 1 or more Regionals. Exactly 1 Master had attended every Regional of the season (that player may or may not be the one writing this now). A single player each had attended 10 events and a trio each had attended 9 and 8, respectively. There are a lot more players so far this year—roughly 1500, or about 18% of the active playerbase. It’s worth noting that the only Regional that “crosses over” in my time split is Salt Lake City, meaning it’s the only one whose “locals” are included in 2017, but not in 2018 (unless the area lost its Regional altogether, a la Phoenix, AZ and Athens, GA). Given its status as one of last season’s smallest, the skew on the data will be nearly zero. As you can see, there’s a lot more activity at the very top of the frequency charts. We’ll get to this more later when talking about Top 16, but it’s also key to realize here that more players are attending 2, 3, or 4 Regionals this year, too. I would personally wager a guess that this is the result of TPCi making the invite seem easier at the beginning of the season, and would guess that we see less-and-less people in this range at future events—it’ll be more players that attended everything or have attended nothing. We’ll see in July. So, moving from 2017 to 2018, we know that there are more players in the game. This is something we could figure empirically, too: Facebook groups have never been larger, I’m sure coaching business has never been busier, etc.—but, showing this numerically is useful, too. It helps confirm that we aren’t merely seeing more players attend more often: we’re also seeing more players attend period. This is important to Regional TOs in their marketing efforts, I think, and also makes an interesting angle to the argument that Pokémon Go is responsible for much of the boom we’ve felt over the past few years. Today, I won’t get into figuring out how many of these players attended only 1 Regional ever over the pair of years today, which would be the better metric of “new” player—I’ll save that for July and end-of-season. But, considering Pokémon Go made its debut in summer 2016, I have trouble attributing the 2017-to-2018 growth to its effects. Before I head off to the next section, another interesting angle to this: how many players earn Championship Points over the course of a season. As I noted above in the written explanations, roughly 20% of the playerbase has earned Championship Points at one Regional or another during the course of our theoretical “partial season.” Interestingly, despite the explosion in event size, this is constant across the two seasons. Far more players are earning multiple finishes than we saw last season. Once more, we’ll get into the trends at the top of the chart when we discuss Top 16, but for now, it’s simply worth noting the greater proportion of people chalking up finishes. At the end of the season, it’ll be interesting to compare this to an expected breakdown based on the number of available finishes this year—if the proportion of earners to earning spots is different year-to-year, it could imply something’s shifted. 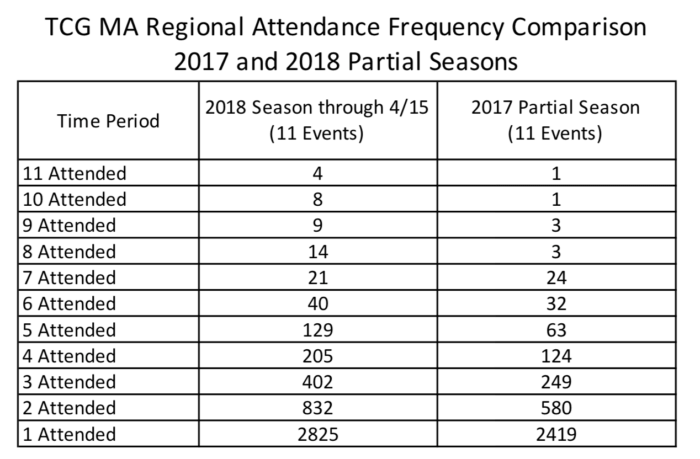 When I saw the data I laid out a moment ago, I began to wonder if there was any noticeable difference between Regionals as to how many of the players in attendance have only attended one event all year. That is, does, say, the Pacific Northwest draw more one-timers than the Midwest? Florida full of those just trying the game out? The link between attending one Regional and “new” player is probably somewhat weak, but I think I can make a convincing case that the link between a person playing only one Regional and their overall involvement in the game being weaker is fairly material. After all, if you are only preparing for a single Regional all year, you’re not exactly in the thick of the game very often. This could, arguably, make for an easier Regional. 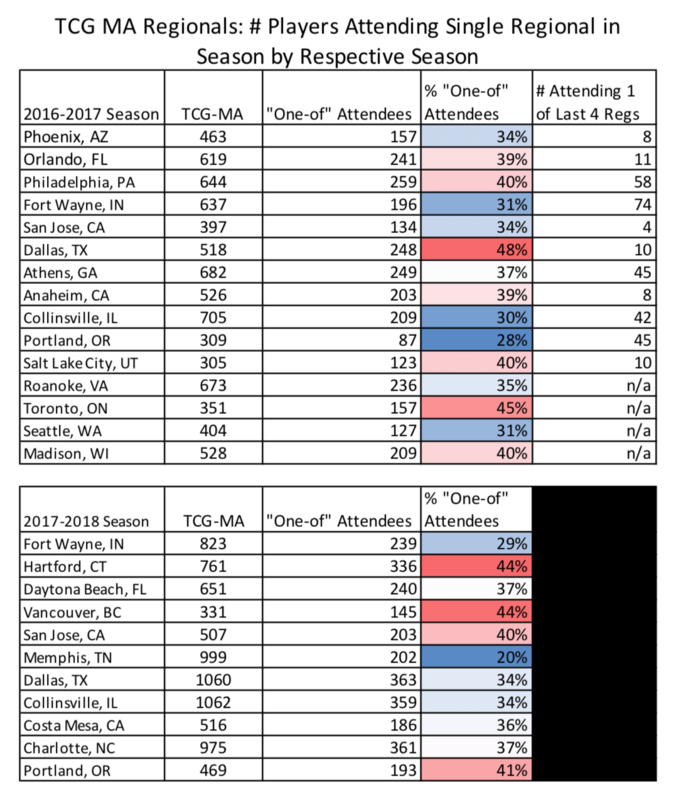 Here’s a Regional-by-Regional breakdown of the number of “one-of” attendees for the last two seasons (within an event’s own season). The last column in 2016-2017 denotes the number of that Regional’s attendees that went from being a “one-of” attendee to attending 2+ events over the course of Roanoke, Toronto, Seattle, and Madison. There are a lot of potentially interesting explanations for these trends. 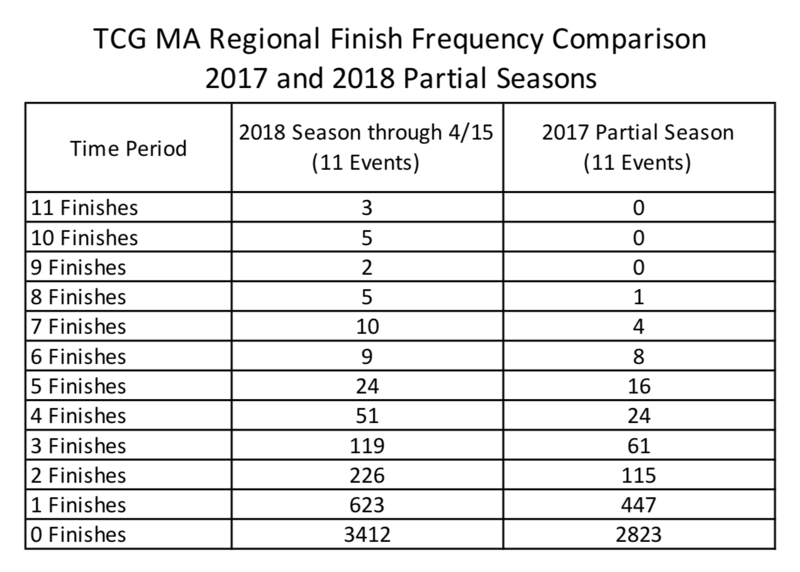 Last season, whose data is more reliable because the entire slate is accounted for, Dallas is notable as an outlier: almost half of its Masters didn’t play another Regional Championship last season! This would indicate that the region is perhaps underserved, or at least that there is a large local playerbase. We see that number drop substantially this year, though it’s worth noting that it was essentially the cheapest trip the average American outside driving distance could find this season—encouraging it to be “the one” if players double-up (indeed, around 250 players made it their second event of the season). In 2017, Portland swung a lot in “status” once Seattle was accounted for—about 40 players participated in Portland+Seattle and no other Regionals last season. Portland was the lowest one-of attendee rate on last seasons’ schedule, but without Seattle, I doubt we see that again this year. This, coupled with the high rate of one-of status we saw in Vancouver this season (and, that region is “done for the year”, so to speak) implies Seattle and Vancouver aren’t quite as interchangeable of locations as one would perhaps have expected in August when the change was made. Vancouver had a relatively high percentage of local playerbase, apparently, but that doesn’t mean as much when attendance is as low as it was. 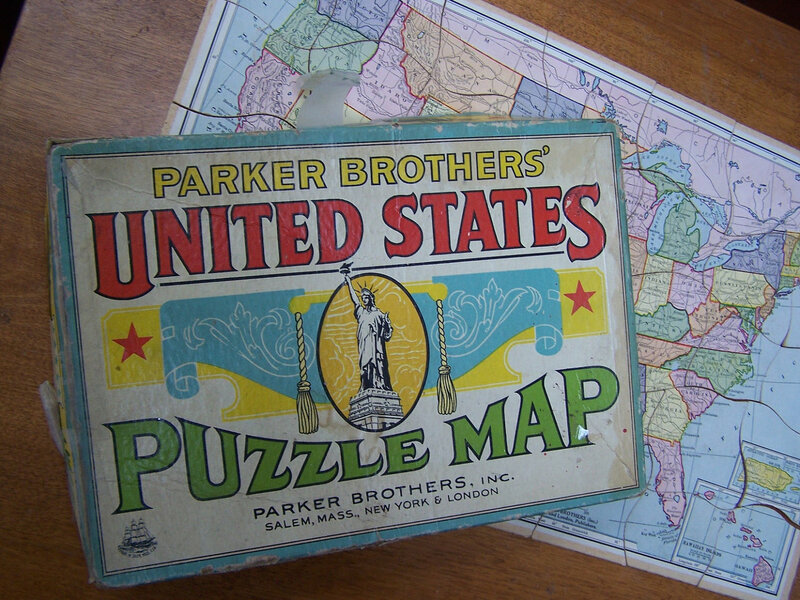 The Northeast is an interesting region to examine. So far, Hartford is a leader in this stat this year, and while I expect Roanoke and Toronto to reign it in a bit, I expect it’ll remain relatively high on these charts as the season wraps up. The Philadelphia number in 2016/2017 is fairly high, too, which suggests to me it’s an underserved area in terms of potential attendance. Personally, if I were making the swaps, the New England area looks as though it could sustain another event. It’ll be interesting to see where these numbers fall once the season is over. For now, they’re mostly just an amusing talking point, but I have some potential applications to perhaps explore when all is over for the year. I won’t belabor this, as the reality of the numbers is that Top 16 and its pursuant group is a strong minority of the playerbase. Nevertheless, it’s worth noting that the minimum number of Regionals attended by a current member of the group is 7—Zakary Krekeler’s strong run in London facilities his current position in 15th. Otherwise, the strong majority of the group is already in double digits for attended Regionals. At this point last year, only 8 players had attended 7 Regionals, and now it is the baseline standard to cling to a Top 16 berth. Notably, only two players have attended 10 or more Regionals and are not currently in Top 16. This isn’t anything that anyone sitting in this group doesn’t already know, of course. The attendance demands to keep pace have only increased this year, with most involved players set to attend every North American event for the remainder of the season. Next year, I expect the standard will be nearly 100% attendance, unless systematic changes are employed. A good chunk, though, will be at more than 100%: those Latin America Special Events are on the North American Top 16’s minds, now. I believe a Best Finish Limit will only be marginally helpful in mitigating the need to be everywhere (the problem is that there’ll always be pressure to improve that lower, languishing finish). Nevertheless, it’d be some help, so I’d welcome it with open arms. I’ve been on record before as saying I won’t do the Top 16 grind again, and in its current form, I stand by that still—though, that’s another topic best fit for the end of the season. The year’s flagship event could be, uh, huge. Last season, a total of 4257 unique players participated in North American Regionals. Given we’ve blown by that with events to spare, it’s a sure conclusion that the circuit has grown. Only time will tell where that growth continues to go. One final thought: last season, that 4257 number led to a North American International Championships of around 1400. Given that event capped, it’s not unreasonable to set a baseline expectation of NAIC participation around 33%. If we take 33% of today’s roughly-5000 active North American Masters, that’s a rough estimate of 2000 NAIC seats for TCG Masters. That’s, in my mind, a very conservative estimate. I’m not convinced TPCi is interested in operating the event at such a large capacity. It’s clear to me that they anticipate having room for at least 1600 Masters, as they added the kicker for Top 512 Championship Points at that point, but there’s no telling how much bigger their plans are for. When registration goes up, you would be wise to not delay. I’ll be back with my regularly scheduled Underground content after the Latin American International Championships. Until then, if you have any questions about anything I posted here, or otherwise, feel free to find me on your platform of choice. Does the End Justify the Meme?